Authors: P. Pietrukowicz, W.A. Dziembowski, M. Latour et al. Has the Sun ever winked at you? It was probably too subtle for you to notice, but this definitely has happened. Our Sun’s brightness is constantly varying due to convective bubbles near its surface. Other stars similar to the Sun undergo the same process, forming a class of pulsating stars called solar-like oscillators. This is only one of many classes of pulsating stars. We are very lucky that stars pulsate and we are able to detect that: this is the only way we can explore the interior of stars1. The frequency of the pulsations we can detect depends directly on the internal structure of the star, so this method allows us to probe stellar interiors and check if what we obtain from our stellar evolution models is correct. The first object of this new class was discovered back in 2003. It showed variations of 0.24 magnitudes with a period of about half an hour. The shape of the light curve and the period were similar to the very common delta-Scuti stars, so at first the star was classified as that. The amplitude of the variation, however, is much higher than any known delta-Scuti is this period range. This motivated the astronomers to flag this object as a puzzling variable and schedule a spectroscopic follow-up so they could learn more about its properties. 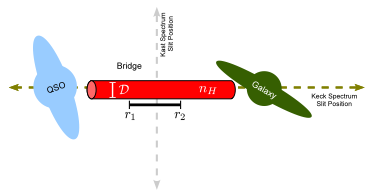 Modelling the obtained spectrum, the authors found the object had a temperature over 30,000K and surface gravity with a log g of 5.3. This temperature is way too high for delta-Scuti stars, and the log g indicates the object is not on the main sequence. These physical properties are similar to hot subdwarf stars, that get stuck into a core-He burning phase due to severe mass loss, usually credited to the presence of a companion. Hot subdwarfs do pulsate as well, but with amplitudes hundreds of times smaller than for the observed star. In short, its properties did not fit any known type of variable star. 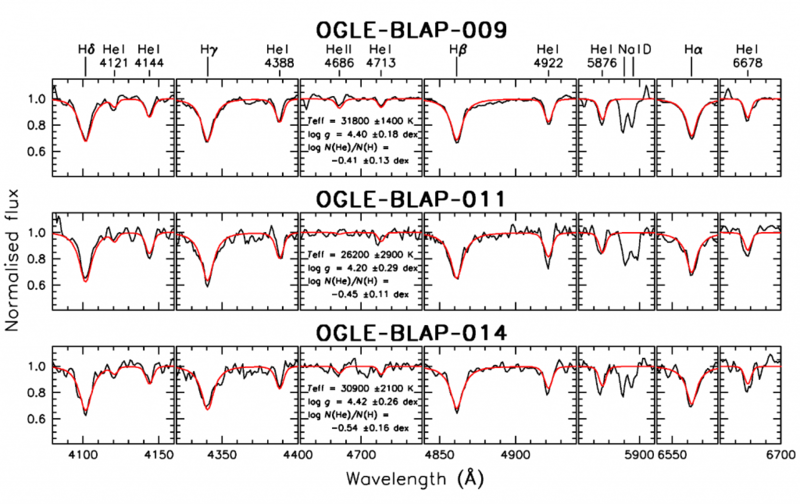 Studying OGLE data, the authors found another 13 objects with these same properties. The light curves for all targets are shown in Fig. 1. Besides the high amplitude, all of them have extremely blue colors, reflecting the fact that they are hot. Hence they were dubbed blue large-amplitude pulsators, or BLAPs, for short. As is the usual approach in astronomy when we discover something we don’t quite understand, the authors set out to obtain more data for their newly found discoveries. In intermediate resolution spectra obtained for four stars, three of them showed in Fig. 2, they’ve found that the surface gravity is slightly smaller than previously thought, with a log g of around 4.6. That is still too high for hot main sequence stars (log g < 4.3), but now rules out that the objects are hot subdwarfs (5.3 < log g < 6.2). They’ve also noticed that the temperature changes by at least 13% throughout the pulsation period, and that the stars are moderately rich in helium. 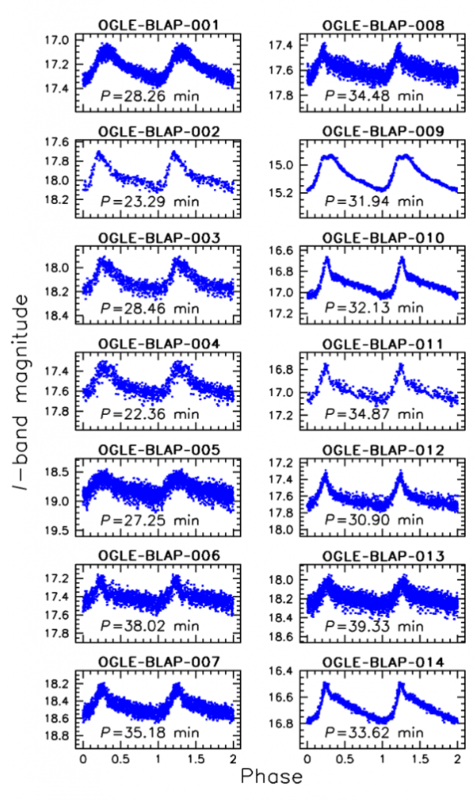 Analysing long-term OGLE data, the authors estimated the rate at which the period of the stars is changing, and found it to be quite low, indicating the pulsation is stable. This implies that the interior of the star is not changing significantly, so they must be evolving in a slow timescale. As the authors already ruled out the main sequence, two options are left: the objects could either be already burning helium in their cores (instead of hydrogen, as on the main sequence), or be red giants burning hydrogen in a shell outside their helium core. The first option requires that the object lost a lot of mass, so the high temperature is explained by us seeing almost inside the core, which is hot enough to burn helium. The second model doesn’t require such a severe mass loss, but the red giant would still have to be stripped somehow of its outer layers, so we can see close to the hot burning shell around the core. The two models predict slightly different luminosities, so we should be aiming at obtaining more accurate measurements of the gravity, allowing for an independent estimate of mass and luminosity to select between the two proposed models. However, even if we end up being able to tell which model best explains the BLAPs, the formation scenario is still a mystery. What led to the severe mass loss or stripped the giant of its outer layers? The easiest way to achieve that would be a binary companion. The authors found no evidence for it, but the possibility of a faint unseen companion cannot be ruled out. A search for these possible companions would be a good next step on understanding the BLAPs. Their small number in comparison to hot subdwarfs, for example, suggests they are rare episode in stellar evolution. Let’s not miss a chance to crack it!